An outdoor light that makes a wonderful contemporary statement, the elegant Assisi LED planter (as pictured above) helps bring the inside, outside. Your customers or clients will love sitting in the garden with these inviting plant pot lights dotted around the garden. LED Planters are perfect for hotel, restaurant or bar gardens. 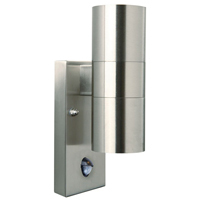 The Atila LED Post Light is very sleek and brings a sophisticated, contemporary look to your premises, thanks to its thin design and stainless steel casing .Its IP44 rating makes it suitable for life outside. Use it to light up garden paths, or driveways for your employees and customers, allowing them to work or relax in comfort. Create soft, ambient lighting with these wonderful outdoor post lights. Carrying on the theme of sleek and contemporary is the Stainless Steel Twin Wall Light, which gives a column of light both above and below the fitting. This outside light is perfect for creating ambient lighting outdoors. It has a quality Danish design that won’t let you down - perfect for use in public places. Its durable IP54 Rating means it can withstand the harsh outdoors without losing function. Next we have the Albany walkover light. This submersible light has an incredible IP68 Rating. Completely watertight, this durable light is perfect for lighting paths and decking where water might accumulate. It can even withstand water up to 1m deep - use it to illuminate water features, ponds and waterfalls. This is a great tool if revamping a garden for clients or if you want to set your hotel, restaurant or pub grounds apart from others. Keep you, your premises, customers and employees safe with this Twin LED PIR Flood Light in Black. What better way to feel safe and secure on your premises after dark than with this powerful LED Floodlight. This outdoor security light is incredibly low energy; it’s equivalent to 200W halogen light output and yet uses only ten percent of the energy. It’s also easy to install and maintain and gives you the option of PIR or Dusk ‘til Dawn sensor. Work or relax with the peace of mind that quality security brings. Bring a touch of Scandinavian design to your garden with this Vejers down wall light - Galvanised. Incredibly sturdy and durable with an IP54 Rating, in its galvanized finish, this light functions fully even when exposed to harsh elements in coastal locations. Use it to light up the outside of buildings, even in exposed weather and rest assured it won’t let you down. The downlight design also makes it a good tool for lighting up areas of outside space you want to be seen such as plant displays. Next up we have the Metro Set of 10 Ground Lights, which come complete with everything you need to install instant glamour to an outside decking space. These outside ground lights fit your decking no matter what the size. These white decking lights come in a set of ten but you could buy multiple sets for a more dramatic effect. Make your decking area a cosy ‘inside’ area, outside. At three, we have the Horizon Wall Light, which is completely rain and weatherproof thanks to a brilliant IP65 Rating. Vandal proof and completely energy efficient, this excellent light reduces glare and enables you to direct the light exactly where you need it, helping your employees or clients to work or relax in comfort. The Luxembourg PIR Wall Light combines the best of everything. It looks beautiful and has a unique design that won’t go out of fashion. This outside wall light has been made with incredibly durable galvanised steel and has a quality Danish design, which has been designed to withstand harsh weather conditions as seen on the coast. It has an amazing fifteen year anti-corrosion guarantee, which displays how much faith the manufacturer’s have in it. An excellent IP54 rating means it won’t let you down, even when exposed to the harshest elements. A PIR motion sensor helps keep you, your premises and the people you look after, secure. The GuardCam LED Security Floodlight is an amazing all-in-one PIR security light, speaker, DVR system and camera. It not only light up your premises when it senses motion, but also records whatever has triggered the sensors directly on to an included 2GB SD memory card. You can choose between still frames or video format while the latest LED technology ensures that even night time footage is seen colourfully and clearly. Whether you want to guard commercial or domestic properties or grounds, this brilliant floodlight won’t let you down. Don’t forget to scour the rest of our outdoor lights. Looking for more news, inspiration and advice? Try our Lighting Advice section.